Give your loved ones the gift of a life transformed. Browse through the gifts that each make a difference in the life of someone experiencing homelessness. Choose and purchase the gift that means the most in honor of your friend or loved one. We’ll send you a certificate to share with your friend or loved one this holiday season. One month of counseling for a man, woman, or child. One month of addiction recovery services for a man at The Potter’s House. Provide job training for one man or woman.. Diapers, formula, childcare, and parenting classes to get a mom back on her feet. Sponsor all 40-50 children in shelter to go to one week of summer camp. Send a child to preschool for the year. Two round-trip Marta cards for transportation to job interviews. Provide a man, woman, or child meals for the week (breakfast, lunch and dinner). Ensure a man, woman, or child gets a bed for a good night of sleep in shelter. Called by God to serve the city of Atlanta. 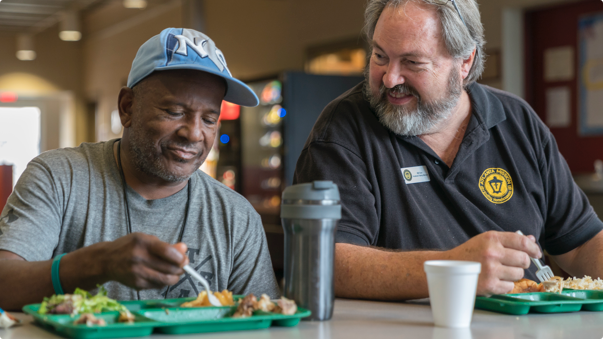 Since our 1938 beginnings, Atlanta Mission has grown from a small soup kitchen to a multi-facility organization serving Metro Atlanta’s large homeless population. Today, we serve more than 1,000 homeless men, women, and children every day. We meet each person where they are, in their unique circumstances, to provide customized services to help them overcome the cause of their homelessness. Sign up to receive stories of the lives that are transformed throughout the year as well as updates about what we’re up to around the Atlanta community.